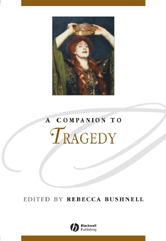 A Companion to Tragedy is an essential resource for anyone interested in exploring the role of tragedy in Western history and culture. Tells the story of the historical development of tragedy from classical Greece to modernity. Features essays by renowned scholars from multiple disciplines, including classics, English, drama, anthropology and philosophy. Broad in its scope and ambition, it considers interpretations of tragedy through religion, philosophy and history. Offers a fresh assessment of Ancient Greek tragedy and demonstrates how the practice of reading tragedy has changed radically.